Baptized as Giuseppe T Capossela, Cappy is known officially as Joseph, his anglicized name. He was named after his mother Giuseppina (Josephine) Cerminelli. Although both of his parents were from the same town of Calitri, Italy, their families had immigrated seperately to the US during the 1890s. Cappy was born on 18 July 1915 in Brooklyn, New York. He was much younger than his four brothers and sisters who were born between 1902 and 1906. Cappy's childhood witnessed life in Brooklyn during the Roaring 20s and the Great Depression. He also had many cherished experiences at Coney Island as he spent his summers with relatives living there. His father, Francesco (Frank) Capossela owned and operated a barber shop until the Prohibition when he bought an old saloon and turned into a pool hall. When Cappy was ten, his father opened a grocery store which he ran until 1935 when he leased it to the A&P chain. Although money was scarce during the depression, the Capossela's always had food and a roof over their heads. Cappy loved to learn things and found school both enjoyble and easy. After graduating from Bushwick High School in 1933 he had to postpone his desire to attend college due to the depression. He landed his first full-time job as a copy boy with the New York Post. Later he was promoted to the financial news department but company cut-backs eliminated the department and he was laid off. His brother got him his next job running a cigar and candy stand at the five horse tracks in New York. By 1939 the US was climbing out of depression. Cappy left his track job and enrolled at Brooklyn College. During the same year he landed a night job as a copy boy with the New York Journal-American. Later he was promoted to apprentice copy editor. In 1942 he got married and drafted into the Army. His whole world was changed forever. Cappy thought the Army would give him a deferrment since he was technically the sole support for his parents, a student, and physically unsuited as his height was below average. But to his surprise he discovered the Air Corps loves smaller bodied men as they weigh less and fit better in the cramp conditions aboard airplanes. 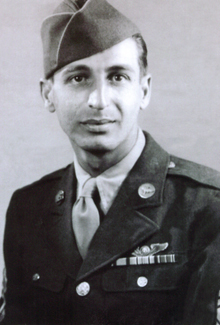 His induction began on 19 September 1942 at the reception center on Long Island. He did his Basic Training in Miami Beach, Florida. In Novemeber he was sent to Radio School in Sioux Falls, South Dakota. Upon his graduation in March 1943, he was sent to Aerial Gunner School in Las Vegas, Nevada, which lasted until June. Fully trained, his first practical duty sent him to the 12th AntiSubmarine Squadron at Langley Field, Virginia. This squadron did not have assigned crews but made up its crews on a daily basis. A side benefit of this practice allowed the men within the squadron to know each other better. Cappy was popular with everyone, officers and enlisted men alike. In September the 12th AS was sent to Blythe, California, for B-24 Combat Training and to serve as the cadre source for the new 492nd BG. The next month his unit was redesignated as the 859th BS, 492nd BG. The 492nd began its group training in January 1944 at Alamogordo, New Mexico. Since Cappy was one of the originals from the cadre source, he did his part in helping orgainize the new group. He was also chosen to help ferry in more B-24s for training practice. Since Cappy was one of the more experienced radio operators in the new group, he was assigned to the Earleywine Crew 901. Captain Earleywine was destined to pilot a Lead Crew. He too had served with the 12th AS in Langley but rather than going to Blythe with the unit, he had taken a crew through Crew Combat Training in Tucson and rejoined the group in January. In April 1944, the 492nd was sent to the war in Europe. Based at North Pickenham, Cappy flew about half of his tour with the Earleywine Crew. In June the upper brass decided to transfer the Earleywine Crew to the 93rd BG for Pathfinder Training, special equipted planes that could navigate and locate targets using radar. Rather than leaving his many friends in the 492nd, Cappy asked to remain behind and be reassigned to another crew. His request was honored as he switched places with the radio operator on the Prytulak Crew 907. He did this knowing the 492nd was suffering high casulties. Cappy's luck would have been good either way as both crews went on to complete their combat tour. The Prytulak Crew had come close to finishing their tour before the 492nd was disbanded in August due to high casualties. The 859th squadron was transferred to the 467th BG and redesignated as the 788th BS. When Cappy finished his tour in November he opted to return home rather than take a non-combat job in England. This was another bold decision on his part as many returning veterans were redeployed to fight in the Pacific. Cappy found himself lucky again. After his furlough, he was ordered to the Radio School at Truax Field in Madison, Wisconsin. There he was assigned to the War Information Office and helped run the camp newspaper. His new duties required him to work with reporters and editors from the local newspapers. When the war ended in September 1945, Cappy was offered a job with the Wisconsin State Journal starting as soon as he was discharged. He dumped his dream of returing to New York and his job at the New York Journal-American. He liked Madison and its people and the job sounded like a good challenge. Not everything in Cappy's life was a bed of roses. Between the war, post war and his decision to reside in Madison... things took a toll on his marriage. Shortly after his discharge he was seperated and in 1949 his divorce became final. His relationship with his beloved daughter JoEllen became a distant one. Cappy began as a copy editor and later turned reporter before being promoted to news editor. He worked there for thirty-two years until he retired in 1977. During his carrer he had to learn the many technical changes that came to the newspaper industry. Technology developed during and after the war destroyed the once mighty world of Commericial Art. Before the war almost all print advertising was hand drawn by commercial artists and good artists were in high demand. Within twenty years after the war this big industry became almost non-existent. Like all newspapers of the day, the Wisconsin State Journal had their own in-house commericial art department. Cappy met and fell in love with Lorraine, a young beautiful artist who worked for the paper. She and Cappy began dating and were married in 1949. It was a happy marriage which lasted a lifetime. Lorraine had left the paper so they could get married and operated her own independent commercial art business out of her home. As the commercial art business declined, Lorraine put her talents towards producing fine arts. Cappy developed a strong interest in her work and soon began creating some of his own paintings. Eventually he gained a regional reputation as a good artist. This became his second career in life. Cappy passed away on 1 September 2005 after reaching his 90th birthday. He is missed by his wife Lorraine, daughter JoEllen and granddaughter Jessica. He led a rich colorful life surrounded by many friends. Perhaps the Wisconsin State Journal summed up his accomplishments best as their article's headline announced, "War hero, newsman, artist Capossela dies."